There is a lot of info to download in the latest swag of reports from Aecom, the folk doing the Passenger Transport Spine Study. Most of Wellington won’t read it – certainly the writers to Stuff haven’t read it, as they blithly mouth off without a clue. I’ll tell you what – I’ll give it a go to read it, and then I’m going to post some snippets of the reports online, cos I’m like that. Awright geeza? ULTra/PODS have been discounted due to the inability of the system to provide adequate capacity for forecast demand. ULTra/PODS provide a capacity to move approximately 800 people per hour from a single access point. Approximately 8,900 passengers per hour are forecast to travel into the CBD by rail in the 2031 morning peak. More than two thousand passengers transfer onto buses, to service these passengers by ULTra/PODS would require three loading stations. The remaining rail passengers walk to their final destination with approximately 2,000 travelling along the waterfront and 2,000 to The Terrace. If half of these passengers transferred to ULTra/PODS then a further three loading points would be required. and urban design and traffic modelling analysis. Additional process will also be followed in terms of identifying more detailed assessment criteria and the MCA framework, appropriate for the Medium List evaluation. Business Case Requirements: Evaluation against technical and planning criteria. Patronage demand and traffic modelling: Assessment of modes against KPI’s with forecasted WTSM (2011) and WTPM. Urban design and Land Use: Understanding of the interdependence between land use and PT and what the triggers are for one to support the other. Identify ways in which designs should be influenced with WCC urban designers to influence future form and design of the area. Concept Designs: Scope out options at a high level based on design and operational criteria derived through the international review process. Social and Environmental Assessment: Effects based assessment to identify the merits and weaknesses of each option (as part of the MCA). Cost Estimation: At an elemental level in order to compare options. The cost estimates will be based on a broad definition of scope and functionality including a scale plan with typical cross sections. Elemental rates will be derived from international reviews and adjusted for local conditions. Risk contingency will be based on a general contingency. PTSS, ULTRa/PODS, MRT, MCA, PDQ, SYFPH…. can you help some of us out in understanding some of these acronyms and what they really mean? just learned today that AECOM owns Davis Langdon and property/design consultancy DEGW. No, sorry, can’t help you there. Some of them are in the diagrams up above. Others : I dunno. But I can tell you a little secret about Rob Whyte, the traffic engineer on this project, used to work at NZTA on the Transmission Gully project, and then the Basin overpass. But before that he was in the UK, working on a navy base or something. I’m trying to find out how much he knows about planning an underground. What is also apparent from the map up above, is that some of the route options have been discarded. The route coloured green, known as North, otherwise known as the Terrace, has thankfully been discounted. Bit of a no-brainer that one, really, isn’t it? Not really even sure why it would have been on there. The Terrace has always been way too steep to send trains up there, and modern buses are far too wide to consider making it a main route. The other route dismissed already is the South-West route, the pink route as shown here, otherwise known as Wallace St. Again – not really sure why that was in there. But I’m glad it has been dismissed. 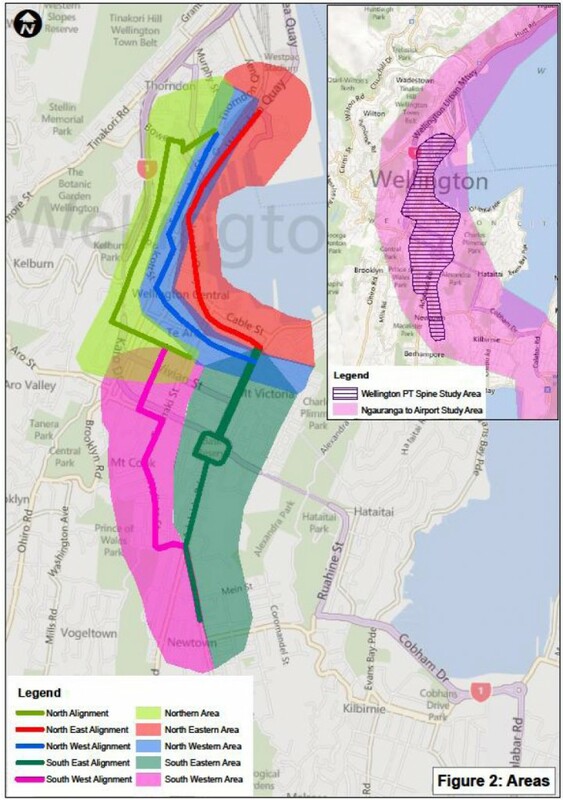 I’m wondering, just wondering therefore: have the Aecom planners actually been to Wellington? Isn’t that info something that a local would tell you for free? Or is it really good to have a fresh new eye look at things and give us a robust look, even at the crazy options? I do agree _it kinda feels like we’re back with experts from outside designing our urban transport structure without understanding it – did we ever leave? Min – I didn’t see SYFPH in the article – but I like where you were going with it! Acronym, Definition. AECOM, Albert Einstein College of Medicine of Yeshiva University (Bronx, NY). Pink route = Wallace = hilly + narrow + residential + twisty. All those things are reasons why you would never put a train system through there. If you look at the top graph, right where it says Table 7, you’ll see North-West gets 3 green lights (“All Go!”), while South-West (ie Wallace) gets 2 red lights and a yellow (“sorry sonny, we’ll have to take your keys away – you’re going no further tonight”). You can easily read into these diagrams what the end result will be. Look at that second graph down, the one with all the dots. UltraPODS had 2 red lights, and mini-buses had 3 red lights. 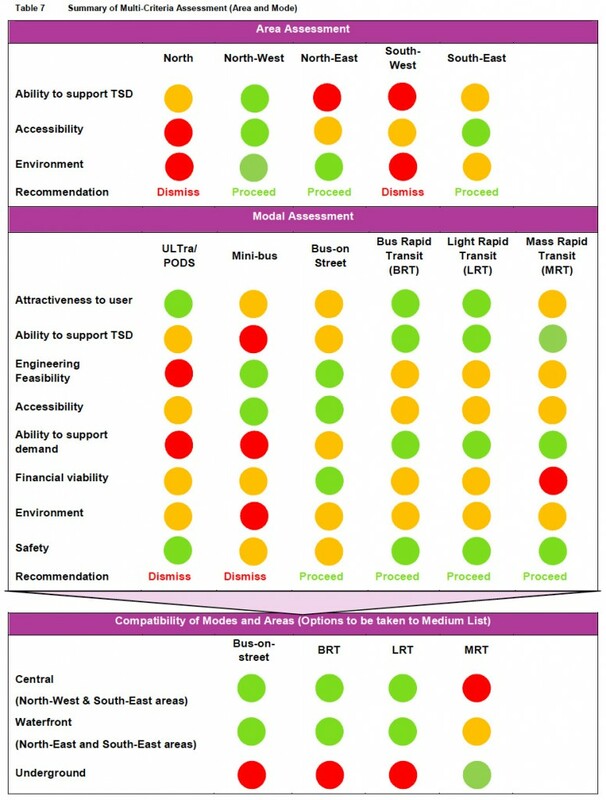 Mass Rapid Transit has 1 red light, under financial viability. That means it is never going to be a goer, but they will leave it in there just to get teh DomPost the chance to get their readers rabid. There is, in truth, only 3 options: Bus on Street (what we have now, surprise surprise), Bus Rapid Transit, and Light Rail. No red lights there. Just green and yellow. And you could argue, more green lights than bus on street. It is possible, just remotely possible, that we may yet get a Light Rail (Modern Tram) system. And, as you say Denny, solving the snafu round the Basin needs to be factored into that now. “Those with institutional memories will note that another feasibility study was completed in 1993, which found that public transport demand along the Golden Mile was more than adequate and cost effective for light rail (modern tram). Yet nothing happened! This study will go the same way unless a project for the design and construction of an affordable option gets into the Greater Wellington Regional Land Transport Programme.